Thank you, Carla! I truly appreciate your comments!! Thanks so much, again, Madalena!! I'm so happy you started this new Women Painters group! I had missed you very much! CONGRATULATIONS!! Featured on Women Painters. Very well done! Great artwork!!! Thank you also for featuring this one in Premium FAA Artists, Marinescu! Lil, This Pops at me with Stunning Colors, and A Stain Glass Effect... How beautiful is this!!!!!!!!!! fav/vt! Thank you my friends, Marsha and Chrisann!!! Lil,Adore this one.So Perfect!!! !But so Special. Having hard time with Magnolia. Don't think I will do another. Hugs,Marsha Vote hun!! I love your use of color in your watercolors! I love this, reminds me of Georgia O'keefe. Beautifully done Lil. Adding facebook like as well! 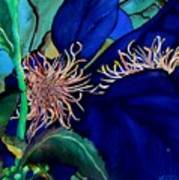 Wonderful detail on your clematis. Beautiful work. This original and signed watercolor was just completed and is probably not dry as I type this. I had a climbing plant of beautiful purple Clematis with gorgeous and vivid colored petals and puffy, light colored spidery middles. It was just gorgeous and bloomed profusely while the backyard beauty climbed blithely up the column of my back porch. Butterflies visited constantly. 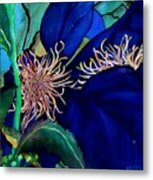 It was so magnificent, I took many, many photos of it and captured a very close-up of two together in this photo-inspired floral painting. It is backyard gardening at its most lovely! 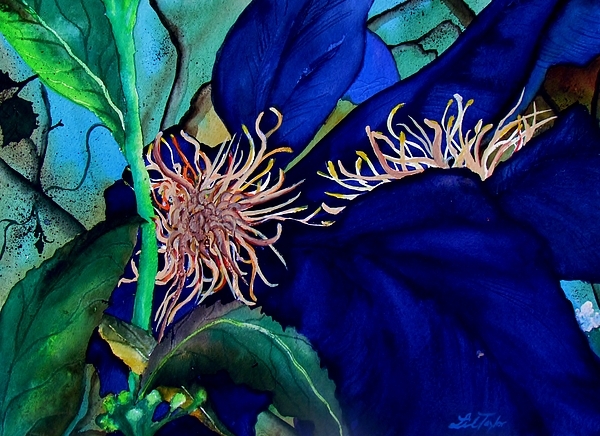 This painting is on cold-pressed Arches paper and unframed.